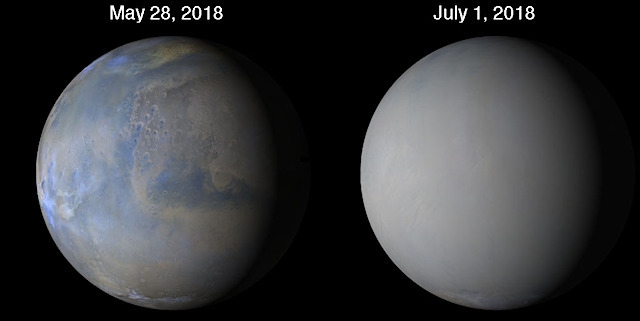 July 4, 2018: Opportunity Sleeps as Storm Chasers Study Planet-Encircling Dust Cloud: As a monster dust storm grew to encircle the Red Planet in June, Opportunity spent most of the month in the dark, presumably sleeping in a hibernation mode as the sky over the Mars Exploration Rover’s campsite in west rim of Endeavour Crater, about halfway down Perseverance Valley, became darker and darker. Since then, the rover has been silent. “There has been no further communication from Opportunity and we do not expect to hear anything for several more weeks, maybe a month or more,” JPL’s Chief of MER Engineering Bill Nelson, said at month’s end. The good news is that it’s springtime at Endeavour Crater and the power models continue to indicate Mars’ cold temperatures won’t get cold enough to harm Opportunity’s instruments. All that dust in the atmosphere is preventing the Sun from heating the surface during the day, because it’s heating the dust at the top of the dust cloud. So while the temperatures are cooler during the day, the dust cloud radiates at night so the rover actually experiences warmer nighttime temps. Perfect. That’s when the rover needs the warmth the most. This entry was posted in Reports and tagged Cape Byron, dust storms, Endeavour Crater, global dust storms, Mars Exploration Rover, MER, NASA, Opportunity, Perseverance Valley, temperature, weather. Bookmark the permalink.